Rabbit anti Bovine, Canine, Equine, Human, Mouse, Porcine, Rabbit, Rat RG9MTD3. 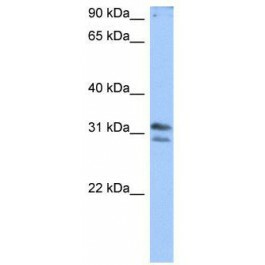 The immunogen for anti-RG9MTD3 antibody: synthetic peptide directed towards the N terminal of human RG9MTD3. Synthetic peptide located within the following region: GEILATGSTAWCSKNVQRKQRHWEKIVAAKKSKRKQEKERRKANRAENPG. RG9MTD3 belongs to the R methyltransferase trmD family, TRM10 subfamily. It is a probable R methyltransferase.